THE JIMI HENDRIX EXPERIENCE - AXIS BOLD AS LOVE VINYL (LP) | Online Shop | Wizard LTD. Album: "AXIS BOLD AS LOVE VINYL (LP)"
Axis: Bold as Love, the second Experience album, was released merely six months after their debut LP Are You Experienced, at the end of 1967. Many of the album&apos;s songs were composed with complex studio recording techniques in mind and as a result were rarely performed live. Only "Spanish Castle Magic" and every-guitar-player&apos;s-ultimate-study-material "Little Wing" became staples during concerts. 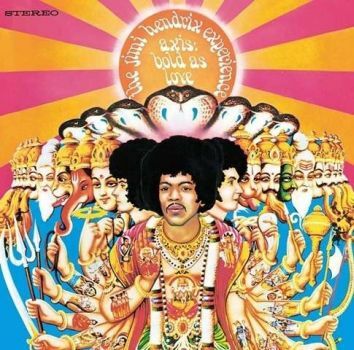 The album shows an incredible growth in Hendrix&apos; songwriting and sonical versatility. Radio friendly rockers like "Wait Until Tomorrow" and "You Got Me Floatin&apos;" are mixed with ballads such as "Castles Made Of Sand" – the album&apos;s variety makes it a delightful listen.